OK, OK. I really don’t know much about football. (And I *know* I’m not the only one, right?) But I know that Super Bowl parties usually have really good snacks, and the televised event is full of very expensive, sometimes moving and sometimes hilarious commercials. And yes, I know that there are some pretty good reasons to feel icky about supporting the NFL. But I also know that one of the few Jewish players in the entire NFL, the New England Patriots’ wide receiver Julian Edelman, was the essential ingredient in his team’s winning of the Super Bowl last night. (The Patriots now tie with the Pittsburgh Steelers for the most-ever Super Bowl championships.) In fact, Edelman was named the game’s first-ever Jewish MVP (most valuable player). And I also know this: He seems like a pretty cool guy. But in recent years, he’s taken to proudly displaying his Judaism and his love for Israel in many different (and creative!) ways. Edelman has a daughter, Lily, with his ex, Swedish model Ella Rose, and the pictures he posts of the two of them together will melt your heart. We really love the way Edelman celebrates the Jewish holidays on social media! In a moving Rosh Hashanah message this year, Edelman wrote how grateful he is for his daughter and his family, and added the Hebrew words for “happy new year.” For Passover 2015, Edelman went for funny instead of heartfelt and posted a hilarious meme to Twitter, which shows him catching a matzah. You can see highlights of Edelman’s first visit to Israel in 2015 with representatives of the Combined Jewish Philanthropies of Greater Boston and a group of Boston-area young adults in the beautifully produced video below. It includes him in riding a camel, going to the shuk (market) in Tel Aviv, teaching a young Israeli to hold a football, going to the Western Wall and putting on a kippah and tefillin, chomping down on some pita, and going to the Dead Sea. You can also hear Edelman abundant use of the Arab slang saying “yalla” (for let’s go), which is very popular in Israel. Edelman wore cleats that honored of the victims of the Tree of Life Synagogue in Pittsburgh. The cleats have the words Tree of Life in Hebrew on them, with the hashtag #StrongerthanHate. In a chillingly moving post, Edelman shared pictures of the cleats on Instagram with the names of all 11 victims. He told CBS that after the game, the first person he wanted to call was his mom. “I just said, ‘I love you,’ and [that] I appreciate her,” Edelman told CBS This Morning. Of his family, he said: “I wouldn’t be where I’m at without them. Sometimes you just got to say it to let them know.” What a mensch! 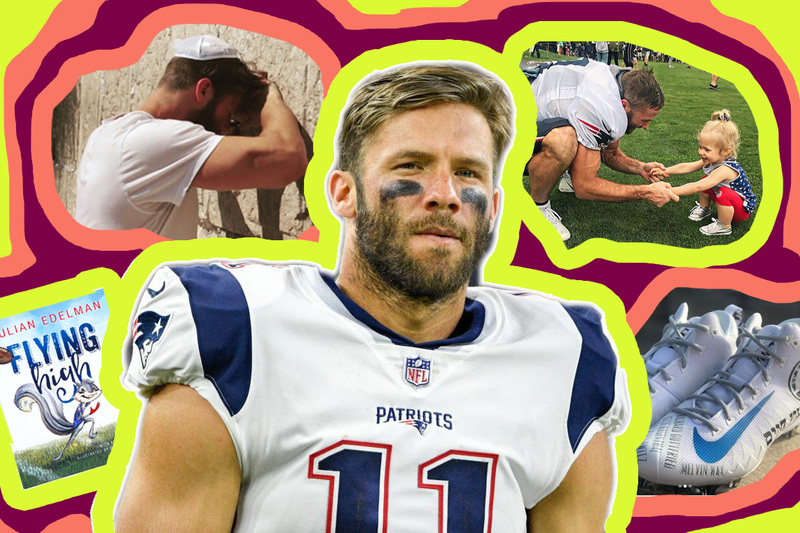 When asked how he felt about becoming the 2018 Super Ball MVP, Edelman responded with a hearty “l’chaim,” a popular Jewish phrase that means “to life!” Not only is that adorable, but it’s pretty special given that that he’s the first ever Jewish player to win this title. Ok, this one is kind of self-explanatory!